I’m going to talk about an issue I had with remoting a few days ago when handling a specific scenario with a server and a client. You know remoting is no longer the newest and cooler technology out there, since WCF is being there for a while, but AFAIK we don’t have WCF yet on Mono, which means it simply doesn’t exist for me and all you multi-platform people. So, that’s why I’m still diving into the deep remoting implementation looking for answers. Ok, you see there’s nothing special so far. Just a few lines of code to implement the shared interface and the server code to start up the service and publish it. 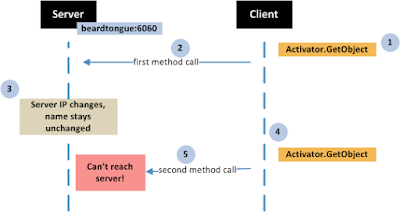 It simply access the remote object (specified at the command line, in my case something like tcp://beardtongue:6060/remote), makes a call, waits for a user key hit, and runs a second call. I’m using TCP remoting channels in binary mode. Let’s see: I have a server up and running, then my client makes a first successful call. My laptop is suspended and awakened with a new IP address. Then the client tries a new call and it fails. I changed from 253 to 245 each time I changed IP. Why doesn’t it work if I’m using the server name instead of the IP? Shouldn’t it work? Then I run the test using the Mono runtime and... it worked!! In fact, I was playing with a custom TCP channel I wrote deriving from the Mono TCP channel (implementing SSL and some other tuning) and it was working too... So the problem with the .NET implementation is somewhere in the TCP Channel, not the remoting stack. which basically checks whether the underlying socket is still valid each time it is retrieved from the internal TCP channel socket cache. When the server’s IP changes and the client tries to run the next call it detects that the socket is no longer usable and creates a new one. This is not happening on the .NET stack (I’m talking about 1.1, didn’t check whether it is solved on .NET 2.0 or 3.5) and the initial socket is reused to issue the next call, and simply raises an exception after a few seconds when it can’t reach the server anymore. The problem could be probably fixed somewhere inside the remoting library, maybe at the SocketCache.GetSocket method, where the RemoteConnection is retrieved from a HashTable and the underlying socket is used but never checked. Fortunately it’s not an extremely common scenario for server applications, but if it happens to you try to grab another TCP channel (use the one from Mono) to get it fixed. Interesting article! I'm currently developping a "quick" client/server solution to administer and run some batch-work run by night, using Remoting for the communication. Yes, the problem is still in .NET 2.0 as I have run into it also, in a situation where the server has a dynamic address. I am planning on handling this scenario by detecting the failure to connect, and re-establishing a new connection, if necessary by doing the DNS lookup myself and connecting by IP address. We have a slightly different setup but the same issue. We're also using .NET 2.0. Our client devices have a docking station they can use for hard-wired network access but they also have a wireless module they use when lifted from the docking station. When switching from hard-wired to wireless or vice versa the NIC and IP address they use to connect to the server changes. The client device still gets its message sent to the server but the server seems incapable of figuring out where to send the return message. It seems it's still trying to send the return message to the previously used (now invalid) network card of the client and doesn't notice the message it just received didn't originate from there... Hopefully we can fix this by reinitializing the objects on the client side when the connection status of its network adapters changes.